Union County Schools will be CLOSED Monday, September 11th and Tuesday, September 12th due to Gov. Nathan Deal declaring a state of emergency for all 159 counties in Georgia. Please continue to monitor here for further updates. Fannin County Schools will be closed for students and all personnel on Monday, September 11 and Tuesday, September 12, for students, as well as all faculty and staff, except for 12-month personnel, district directors, and principals. As long as it is safe to do so, all 12-month personnel, as well as district directors and principals, should anticipate reporting by 9:00 a.m. on September 12. These personnel should note, though, that this expectation may be revised, depending on the weather conditions overnight; nonetheless, if you ever believe it is unsafe to report, please notify your immediate supervisor. In addition, the Board of Education work session meeting that was scheduled for 8:00 a.m. on Tuesday, September 12, has been cancelled. Please continue to stay safe! Pickens County Schools closed Monday, September 11th – TWELVE MONTH EMPLOYEES REPORT AT NORMAL TIME. Schools will also be closed on Tuesday, September 12. Twelve month employees will be contacted late Monday as to whether they will be required to come to work on Tuesday. All school activities, including athletic events and after-school programs, will be canceled. 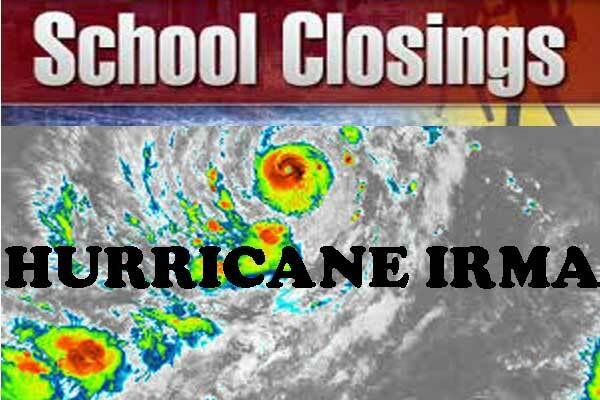 Gilmer County Schools will be closed Monday, September 11th and Sepember 12th due to Hurricane Irma. We have made this decision after consultation with local emergency management authorities and careful consideration of safety factors, such as the probability of severe winds especially at higher elevations, debris, dangerous road conditions and downed power lines left in its wake. Only 12 month staff should report if safe to do so. Dawson County Schools will be closed on Monday, September 11, and Tuesday, September 12, 2017. Twelve month employees will operate on a 2 hour delay. Lumpkin County Schools closed due to the weather forecast for our area, Lumpkin County Schools will be closed on Monday, September 11, and Tuesday, September 12, 2017. The anticipated high winds pose a significant threat to our students and staff. We understand that weather predictions are not always accurate, but we cannot ignore the potentially dangerous situation that this storm poses. Our number one priority is to keep our students and staff safe! Wednesday will still be a early release day as planned so that teachers will be available for parent conferences. 12 month employees should report if it is safe to do so. Towns County Schools closed Monday, September 11th and Tuesday, September 12th for all students. All employees should report at 10:00 AM on Tuesday, September 12th if safe to do so. White County Schools due to the severe weather forecast, White County Schools are closed for students and staff Monday, September 11, and Tuesday, September 12, 2017. Please be safe! Murray County Schools closed Monday September 11 and Tuesday September 12, due to the possible impact of Hurricane Irma. We have made this decision after consultation with local emergency management authorities and careful consideration of safety factors, such as the probability of severe winds, debris, dangerous road conditions, and downed power lines. We understand that weather predictions are often incorrect, but the size of this storm cannot be ignored. It is our hope that Murray County is spared from any of this storm’s impact, but we will always choose to error on the side of caution. All events planned for Monday and Tuesday evenings are also cancelled. This includes the September 11 MCPS Board meeting. This meeting will be rescheduled for Thursday, September 14 at 6:15 p.m. All maintenance, grounds crew, and transportation employees will meet at the transportation office. North Georgia – The North Georgia Health District office in Dalton and our health departments in Cherokee, Fannin, Gilmer, Murray, Pickens and Whitfield Counties will close early to clients and visitors on Monday, August 21st in the interest of public safety during the solar eclipse. 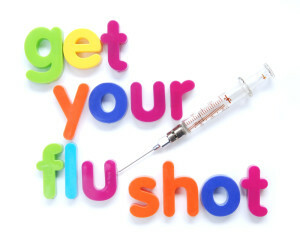 The health departments will close at 12:00 p.m. and the district office will close at 1:00 p.m. This closing applies to all public health services in the district, including Environmental Health, WIC and Children’s Health services. For more safety information, log onto NASA’s website. 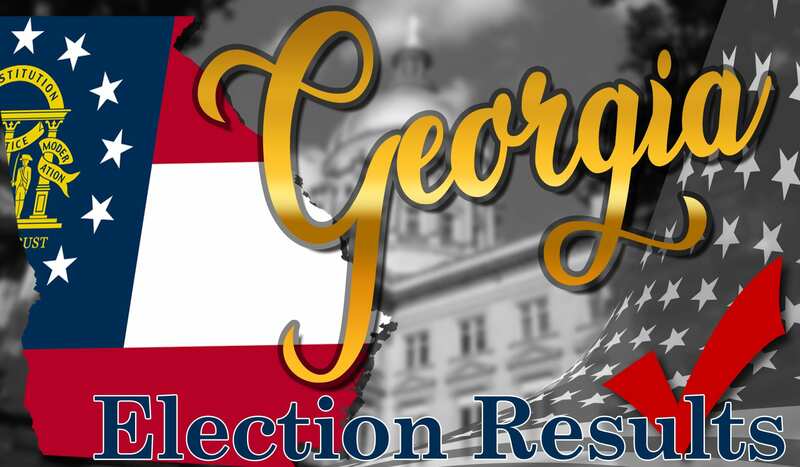 North Georgia – Ready to quit? 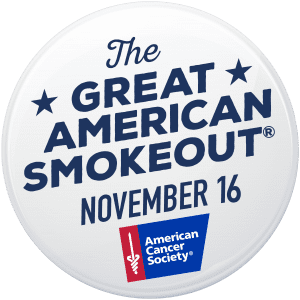 You can do it for at least one day this Thursday, November 16th during the Great American Smokeout®! Every year on the third Thursday of November, many Georgians join tobacco users across the nation in giving up using tobacco and electronic cigarettes for the entire day during this Great American Smokeout® event, initiated by the American Cancer Society. Quitting for just one day is an important step toward a healthier you, especially if that one day can lead to many more. Tobacco use is the leading preventable cause of death in the United States and in Georgia. Over 11,500 Georgians die each year from tobacco-related diseases, including cancer and heart disease. Quitting tobacco and eliminating exposure to secondhand smoke are two proven ways to decrease the risk of tobacco related death and disability. The Georgia Smokefree Air Act, passed in 2005, has reduced exposure to secondhand smoke by prohibiting smoking in all enclosed facilities, including buildings owned, leased, or operated by the State or local governing authorities. Now, it’s your turn to reduce tobacco-related health hazards by quitting the use of tobacco and electronic cigarettes during the Great American Smokeout®. Here in Georgia, we can help. The Georgia Tobacco Quit Line is a free resource that can help tobacco users reach their goal of quitting. The Georgia Tobacco Quit Line (1-877-270-STOP; Spanish speakers call 1-877-2NO-FUME; TTY: 1-877-777-6534 for the hearing impaired) provides counseling for Georgia tobacco users ages 13 and older. Callers speak with tobacco cessation counselors who help to develop a unique quitting plan for each person. North Georgia Health District 1-2 of the Georgia Department of Public Health, health departments in Cherokee, Fannin, Gilmer, Murray, Pickens and Whitfield Counites, Drug Free Cherokee, Cherokee Focus, and the Cherokee Youth Council encourage Georgians to go tobacco-free during the Great American Smokeout®, and beyond! * Union County Schools will be CLOSED Monday, September 11th, 2017 due to Gov. Nathan Deal declaring a state of emergency for all 159 counties in Georgia. Please continue to monitor here for further updates. Fannin County Schools will be closed for students and all personnel on Monday, September 11.A great deal of consideration has been given to this decision. Governor Deal has us under a State of Emergency. Severe weather conditions, such as severe winds (especially at higher elevations), debris, dangerous road conditions, and downed power lines are all possible for our area beginning tomorrow(Monday) morning.Weather predictions are not always accurate, but this storm is massive and cannot be ignored. It is my hope that our community is spared from this, but it is better to err on the side of caution when safety is in question. Please stay safe! 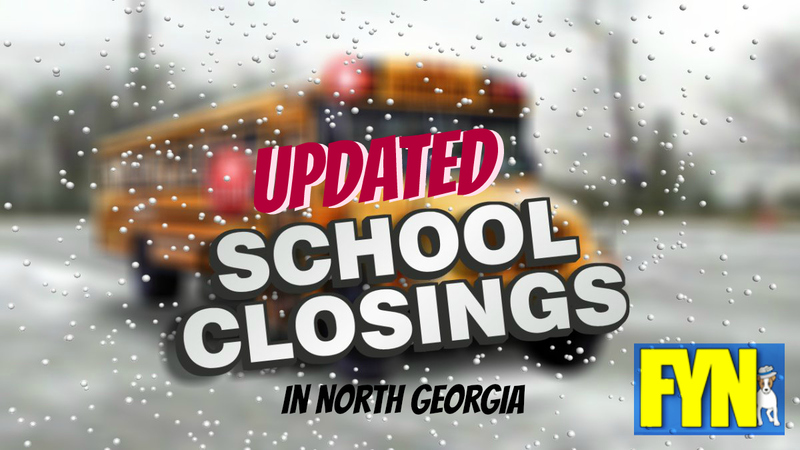 Pickens County Schools closed Jasper, Georgia — Due to inclement weather conditions,the Pickens County School District will be closed tomorrow, Monday, September 11th – TWELVE MONTH EMPLOYEES REPORT AT NORMAL TIME. Schools will also be closed on Tuesday, September 12. Twelve month employess will be contacted late Monday as to whether they will be required to come to work on Tuesday. All school activities, including athletic events and after-school programs, will be canceled. Information will be posted on the Pickens County School District website at www.pickenscountyschools.org, the Infinite Campus parent portal, district and school websites and social media sites, and sent to local media. * Gilmer County Schools closed Release from Gilmer County School School Closed – Monday, September 11, 2017Gilmer County Schools will be closed Monday September 11 due to Hurricane Irma. We have made this decision after consultation with local emergency management authorities and careful consideration of safety factors, such as the probability of severe winds especially at higher elevations, debris, dangerous road conditions and downed power lines left in its wake. We understand that weather predictions are not always accurate, but this storm is massive and cannot be ignored. It is our hope that our community is spared from the force of this storm, but we will always choose to err on the side of caution when our students’ safety is in question. * Dawson County Schools Closed Based on information from the NWS, Dawson County Schools will be closed on Monday, September 11, 2017. Twelve month employees report. * Lumpkin County Schools Closed Due to the weather forecast for our area, Lumpkin County Schools will be closed on Monday, September 11, 2017. The anticipated high winds pose a significant threat to our students and staff. We understand that weather predictions are not always accurate, but we cannot ignore the potentially dangerous situation that this storm poses. Our number one priority is to keep our students and staff safe! Decisions for future closings will be made as more information becomes available. Thank you for supporting Lumpkin County Schools! * Towns County Schools will be closed Monday for all students and staff. A decision about Tuesday will be made tomorrow afternoon. * White County Schools Closed Due to the severe weather forecast, White County Schools are closed for students and staff Monday, September 11, 2017. Please be safe! * Murray County Schools Closed Murray County Schools will be closed Monday September 11 and Tuesday September 12, due to the possible impact of Hurricane Irma. We have made this decision after consultation with local emergency management authorities and careful consideration of safety factors, such as the probability of severe winds, debris, dangerous road conditions, and downed power lines. We understand that weather predictions are often incorrect, but the size of this storm cannot be ignored. It is our hope that Murray County is spared from any of this storm’s impact, but we will always choose to error on the side of caution. All events planned for Monday and Tuesday evenings are also cancelled. This includes the September 11 MCPS Board meeting. This meeting will be rescheduled for Thursday, September 14 at 6:15 p.m. All maintenance, grounds crew, and transportation employees will meet at the transportation office.